Rusty, aka RJ Brave Flyer, is a three-year-old red brindle male, born February 2000. He is a very playful and affectionate boy. 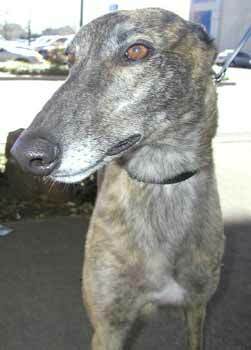 He loves to run laps around the backyard and also enjoys playing with another greyhound in his foster home. 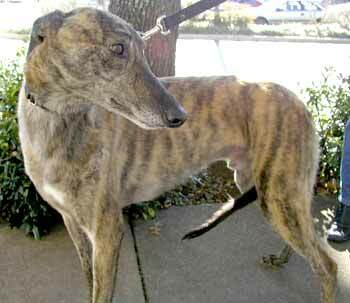 He gets along very well with the two male greyhounds he lives with, as well as the two cats. Rusty enjoys being hugged and loved on, as well as having his belly rubbed. He is in the process of learning the command "sit" - we are just working on consistency. Rusty would be very happy in a home with or without other dogs, as long as there's lots of love to be given to him.